As onshore and offshore wind energy farms have proliferated globally in recent years, new research led by the University of Colorado Boulder highlights a previously underexplored consequence: a wake effect from upwind wind farms that can reduce the energy production of their downwind neighbors. "The findings highlight the need for coordinated development and awareness of the big picture in order to maximize wind energy generation nationwide," said Julie Lundquist, lead author of the study and an associate professor in CU Boulder's Department of Atmospheric and Oceanic Sciences (ATOC). "Just as upstream water users can knowingly or unknowingly impose additional costs downstream, the same effect is in play here," said Daniel Kaffine, a co-author of the study and a professor in CU Boulder's Department of Economics. "We had a general sense of this interaction before and wanted to explore it further using a mix of social science and atmospheric data." Kaffine and Lundquist, both fellows in the Renewable and Sustainable Energy Institute (RASEI), noted that Texas made for a good case study because of its current and future stake in wind energy development, as well as historical parallels concerning usage rights for the state's oil and gas resources. Over a century ago, oil and gas law recognized the "rule of capture," which allows a landowner to capture a neighbor's oil resources by sucking them from an adjacent well. This resulted in poor well-field recoveries and waste, so states intervened to regulate production through well-spacing, pooling and other coordination measures. Similarly, states have developed water law regimes that protect rights for prior users. But current U.S. property law contains no such provisions for wind energy. "It took oil and gas and water law decades to create these legal regimes," said K.K. DuVivier, a co-author of the study and a professor at DU's Sturm College of Law. "It appears that wind energy has not yet reached a similar stage of maturity. I hope this research will help raise awareness about the extent of the waking problem and educate those seeking a legal remedy." But while legal guidance may lag behind, Lundquist emphasized that the team's sophisticated atmospheric science simulations show the wake effect is a highly predictable atmospheric phenomenon that can be modeled and planned for in light of the new data. "It's encouraging that the wake effects seen in the economic analysis are captured by the atmospheric simulations," said Jessica Tomaszewski, a graduate student in ATOC who co-authored the new study. "The strongest wakes occur at night, when the atmosphere is stable and wind speeds and directions meet specific criteria," said Lundquist. "Out of the month of wakes simulated, only 28 hours, or less than 4 percent of the time, had wakes in excess of 20 percent of the downwind farm's capacity, suggesting this episodic issue can be predicted and managed." "Owners and grid managers can use this information to get ahead of the issue. New research at NREL in manipulating wakes might be helpful," said Tomaszewski. "Ultimately, however, better coordination will be necessary to maximize the public benefits of wind energy." "Offshore wind farms are important, but they are expensive to build and mistakes will be equally expensive," she said. 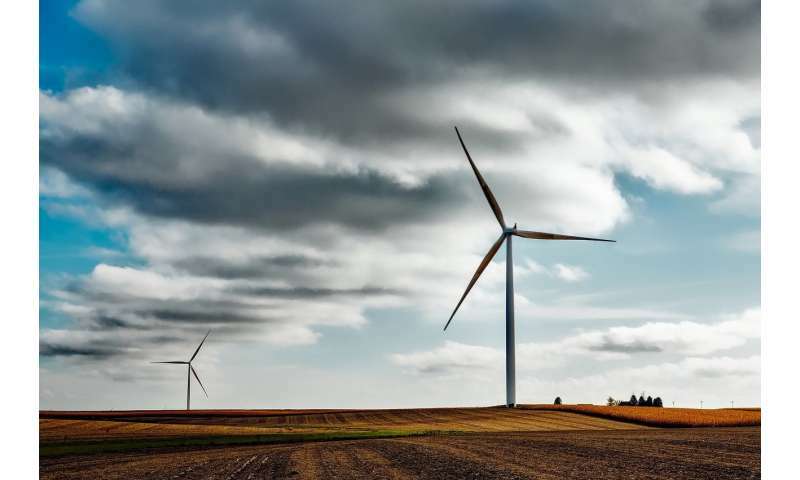 "This project explores the links among economic, legal, and social issues and the geophysical processes in wind energy production," said Tom Baerwald, program director for the National Science Foundation's Dynamics of Coupled Natural and Human Systems program, which funded the research. "These findings advance our understanding of these interactions, and provide guidance for successful development of renewal energy for the future."